We now have smaller sizes available for our High Quality Litho Printed Twist Handle Paper Bags! Litho printing is a great option for both smaller volumes and a high quality finish. We use soft rubber printing plates apposed to the standard metal plates which means you get a high quality finish without the cost of the metal printing plates. The minimum quantity is much less than the standard twist handle paper bags, starting at just 1000 units and these bags are 100% recyclable and the paper used comes from fully sustainable sources. 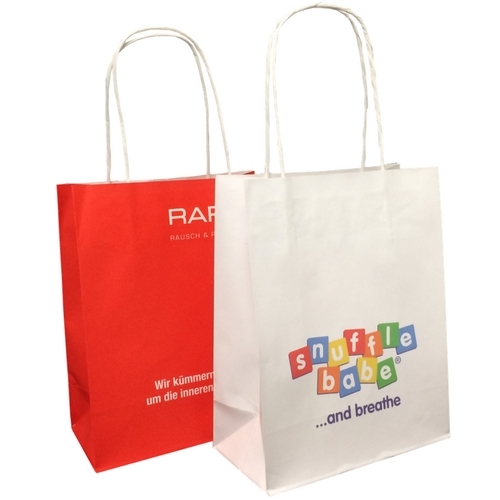 These smaller size paper bags are perfect for smaller products and promotional items.